Dental implants are the gold standard in teeth replacement, but require individuals to have sufficient bone mass in their jaw to successfully accommodate the titanium posts. Fortunately, Dr. Davey Crockett offers his patients bone grafting procedures to restore lost bone density in the jaw. A dental bone graft can help to rebuild the jaw bone so that it can provide a strong and stable foundation for dental implants. Dr. Bousaba can perform all aspects of your dental implant treatment at our Richmond, VA, office. Tooth roots continuously stimulate the bone tissue in the jaw, preventing it from receding and deteriorating. Once a tooth is lost, the bone supporting those roots begins to be reabsorbed by the body, resulting in atrophy of the bony ridge. Replacing the reabsorbed tissue with a bone graft can rebuild important bone mass so it can support dental implants. In some cases, the procedure is combined with sinus lift surgery to restore upper molars. Bone grafting works by using the body's natural ability to integrate with newly introduced bone tissue. There are several different types of materials that can be used in a dental bone graft. Many times, bone can be harvested from the patient's chin, jaw, leg, hip, or another area. The biggest advantage to autogenous grafts is that there is little chance of your body rejecting it. Perhaps the only downside to this method of grafting is the fact that a separate procedure is needed to harvest the bone. This type of bone graft is harvested from a cadaver. It is freeze dried and then vacuumed to remove any water from the bone. This type of bone cannot regenerate like autogenous bone can, but it provides a foundation for your own tissue to grow around. Bone grafting works by using the body's natural ability to integrate with newly introduced bone tissue. Xenogenic bone comes from another species. Most often, cow bone is used in place of the patient's own harvested bone. This type of graft works in a similar way to allogenic grafts and shares the same advantage of not requiring two separate procedures. There are several materials that make up synthetic bone grafts. These materials contain collagen, proteins, and other growth factors that assist with the integration of the material into the jaw. The procedure to place a bone graft is relatively simple and can typically be completed in under an hour. Dr. Bousaba can use a combination of local anesthetic and sedation techniques to help ensure your comfort. Your dentist will make a small incision in the gums to expose the bone and socket. He will place the grafting material into the empty space and use sutures to close the incision. 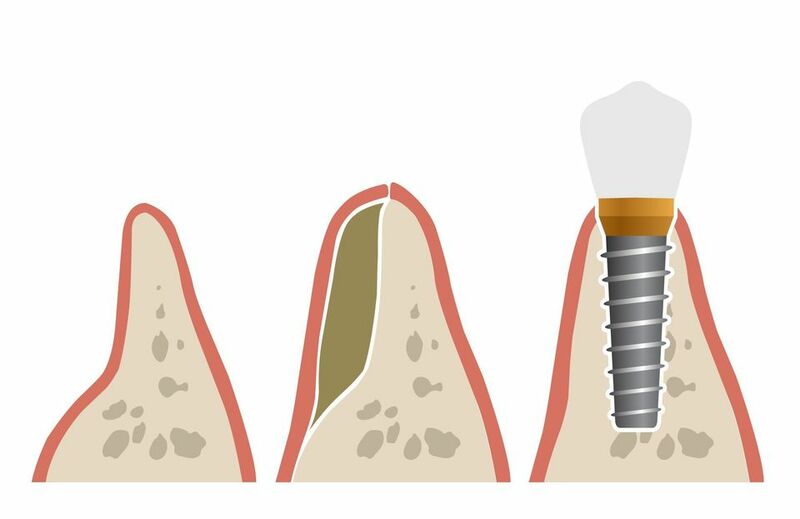 You will heal over the next four to nine months, at which time your implant treatment can begin. If you are struggling with missing teeth or ill-fitting dentures, you may want to consider dental implants. Dr. Bousaba can evaluate the health and condition of your jaw using advanced technology to determine whether or not you need a bone graft. Contact our office online or call us at (804) 282-2990 to schedule a consultation.